We may finally know what Robert Downey Jr. was talking about when he said that there he was working on a deal with Marvel to do something that wasn't Iron Man 4. According to Variety, Downey's in the final stages of negotiations that'll bring Tony Stark in to Captain America 3 and begin the movies' take on Civil War. The executive needed his boss to see the big picture, considering the introduction of the Civil War story is seen as a way to drive the plots of sequels and new franchises for the next seven years, given the dramatic possibilities it offers for future films. The fallout from the government and Stark's actions would factor into a new "Avengers 4″ film and beyond that will assemble new characters being introduced like Ant-Man and Doctor Strange, among others, in their own movies. 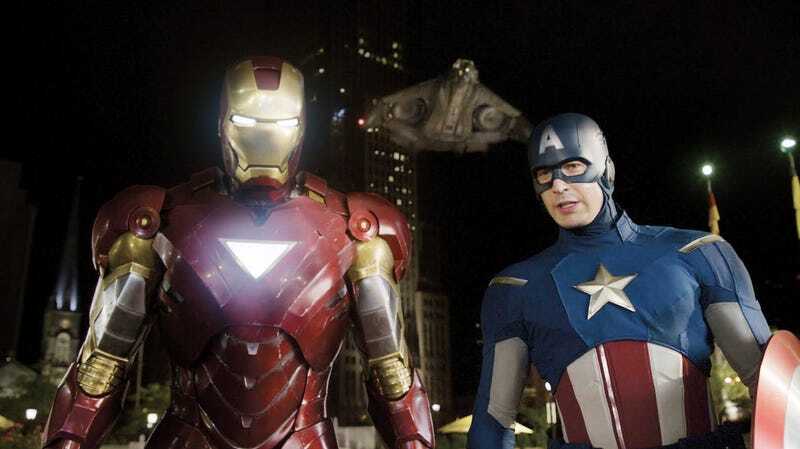 The deal is significant for the Marvel cinematic universe considering the plot will pit Stark against Captain America's alter-ego Steve Rogers, played by Chris Evans, as they feud over the Superhero Registration Act, which forces anyone with superhuman abilities to reveal their identities to the U.S. government and agree to act as a police force for the authorities. Stark supports the program, but Rogers does not, saying it threatens civil liberties, causing sides to be taken and Rogers, among others, to go on the run to avoid arrest. The moral question and battle with his Avengers teammate essentially makes Stark a villain of sorts in "Captain America 3," providing Downey with a meaty role he could play out into future Marvel films, including a fourth "Avengers." Now, Entertainment Weekly says this, which would pay Downey $40 million plus backend participation, is "far from a done deal." And no one's officially commenting on this yet. There's every chance this falls apart, and Marvel either rewrites their plan entirely (unlikely) or shifts Tony's part onto someone else's shoulders. There are other things that make this likely. And here's where we enter spoiler/rampant speculation territory. We've got Marvel announcing a reboot of the Civil War story in the comics, which could very well be designed to put that story back into people's minds before the films come out. And Badass Digest adds a bunch of details, making clear that this is a co-starring role for Downey. They also point out that they've heard that Avengers: Age of Ultron ends with a new Avengers team and Tony retires from superheroing, feeling responsible for the fallout of the Ultron battle. That gives him the motive to be on the side of registration, which'll be a massive shift from where he was in Iron Man 2. They also say that Natasha Romanoff's testimony in front of Congress in Captain America: The Winter Soldier was a late addition to the film. If that's true, that feeds into the general trend of Marvel additions being there to seed future films. Finally, there's the chance that Joss Whedon made sure to set up the Cap/Iron Man conflict in Avengers, because he told us back in 2010 that Civil War comes from their existing dynamic, which culminated in Civil War in the comics and manifested in Avengers as "witty banter." For my part, I'd guess that the rumor that Marvel's trying to get Spider-Man into its films is also related to the Civil War plan. That would give the plot even more scope. There's also the obvious connection that Chris Evans' time as Captain America is coming to an end, and doing Civil War makes killing Steve Rogers a very real possibility. Plus, with SHIELD mostly gone, there's a vaccuum for the Superhero Registration Act to step into. If Tony feels that the Avengers, as privately funded by him, was a disaster, he might turn his support to the act. There's every reason to believe that, yes, Civil War is coming to the Marvel Cinematic Universe. That's a bigger test of audience goodwill than Guardians ever was.